Looking back, I find that it has been over a year since my fingers lovingly touched the keys on this laptop to pen a new review. So many things have happened since then, and life has brought me to new and exciting places. I would love to say that I shall remain faithful to updating this site, but—in all honesty and disclosure—who am I kidding? The changes have meant that I find myself reading less, while desiring/needing the respite and escape tendered in the pages more than the air I breathe. So, dear readers, while I will not give you platitudes of my steadfast endurance to update this regularly, I shall endeavor to try. And now, with that gracefully penned (or typed, as the case may be) introduction, the stage is set with another chilling tale of horror. Since it was left with horror, it seems apropos to start again with the ghastly, grisly, and macabre tale of chilling memory. 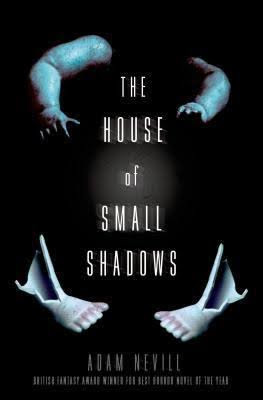 Title: The House of Small Shadows Author: Adam Neville Genre: Horror Pages: Hardcover, 371 Publisher: St. Martin's Press ISBN: 978-1-250-04127-2 Opening Lines: "As if by a dream Catherine came to the Red House. She abandoned her car once the lane's dusty surface was choked by the hedgerows, and moved on foot through a tunnel of hawthorn and hazel trees to glimpse the steep pitch of the roof, the ruddy brick chimneys and the finials upon its sharp spine." "Catherine's last job ended badly. Corporate bullying at a top antiques publication saw her fired and forced to leave London, but she was determined to get her life back. A new job and a few therapists later, things look much brighter. Especially when a challenging new project presents itself—to catalogue Britain's greatest taxidermist, the late M.H. Mason's wildly eccentric cache of antique dolls and preserved animals posed in elaborate dioramas. Rarest of all, she'll get to examine his elaborate displays of posed, costumed, and preserved animals, depicting bloody scenes from World War I. "When Mason's elderly niece invites her to stay at the Red House itself, Catherine believes that her luck is finally changing. She's thrilled to maintain the collection until his niece exposes her to the dark message behind her uncle's 'Art.' Catherine tries to concentrate on the job, but Mason's damaged visions begin to raise dark shadows from her own past. Shadows she'd hoped therapy had finally erased. Soon the barriers between reality, sanity, and memory start to merge and some truths seem too terrible to be real . . . "
One ordinary day, I was reading Gothic Beauty in the local bookstore and stumbled upon Adam Neville mentioned in one of their top horror novels listings. Neville then became a curiosity of mine for quite awhile; however, I was never able to get my hands on any of his books. Partly due to the lack at any bookstores and availability at the library. When I chanced upon this title listed on the top horror novels, I decided to give my local library another go. To add a cherry to the discovery of the book, it dealt with China dolls—one of my biggest fears! To be quite honest, I'm not entirely sure what this book is about. Simply put, I would say that it's about memories and forced self discovery. I'm still torn as to what I think of this book. Elements of it are amazing! The ghastly and macabre air of mystery and the unknown lent to Gothic feel. Neville was able to take the seemingly ordinary and twist it ever so slightly to make innocuous things turn sinister. This gave it an overriding creepy feeling to the whole experience of the book. And, to be quite honest, a book that forces me to look up words is truly amazing and worth a look! Immediately, the book was engrossing and kept me wanting more. I found myself staying up far later than I should just to read "one more page". It would even ride along with me to work, so I could find a few extra minutes to read before I had to clock in for the day. Truly, it was engaging and extremely hard to put down. All of that being said, however, I felt as though many things in the book were not fully explained. Yes, the reader guesses that something happened in London (you're finally told a little bit), but we never really know was fully happened. And, with the little details that are given, I was questioning why she would be hired later on. Yes, yes, we are told and it makes sense in the end, but I was still baffled through the vast majority of the book. In addition to which, not only was I left with unanswered questions at the end, I found the end raising even more questions. For me, that left me completely disheartened by the reading experience. Even days later, I am disquieted when I think about it. It is hard for me to write a proper review of this book when I have such a lackluster attitude walking away from it. In some ways, it is hard for me to put down and let the questions rest. All of that aside, it is worth a read! The narrative style and the captivating mastery of the Gothic novel make it worthwhile in the end!